Ashley Montana Goes Ashore in the Caicos… Or What Am I Doing Here? ASHLEY MONTANA GOES ASHORE IN THECAICOS… OR WHAT AM I DOING HERE? 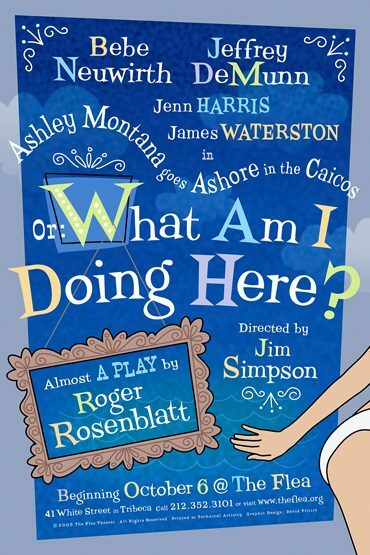 The Flea Theater will present ASHLEY MONTANA GOES ASHORE IN THE CAICOS… OR WHAT AM I DOING HERE?, the newest play by acclaimed writer Roger Rosenblatt beginning October 6th. Flea Artistic Director Jim Simpson directs this World Premiere production. The cast of four stars Bebe Neuwirth (TV’s Cheers, Tony winner for Chicago and Sweet Charity), Jenn Harris (Modern Orthodox, Silence! The Musical), Jeffrey DeMunn (Tony nominee for K2, The Price, Bent) and James Waterston (Mark Lamos’ production of As You Like It at The Public’s Shakespeare in the Park). Opening night is scheduled for October 20th. ASHLEY MONTANA GOES ASHORE IN THECAICOS… OR WHAT AM I DOING HERE? is a series of piercingly funny vignettes about aging, angst, missed opportunities, New York, new age, the next big thing and the last hurrah. Roger Rosenblatt is the acclaimed author of essays, books and plays. William Safire of the New York Times wrote that his work represents “some of the most profound and stylish writing in America today.” Vanity Fair said that he “set new standards of thought and compassion” in journalism. His pieces for Time magazine have won two George Polk Awards, awards from the Overseas Press Club, the American Bar Association, and others. His television essays for the NewsHour with Jim Lehrer on PBShave won the Peabody and the Emmy. His Time cover essay, “A Letter to the Year 2086,” was chosen for the time capsule placed inside the Statue of Liberty at its centennial. He is the author of ten books, which have been published in 13 languages. They include the national bestseller, Rules for Aging; three collections of essays; and Children of War, which won the Robert F. Kennedy Book Prize and was a finalist for the National Book Critics Circle Award. His first novel, Lapham Rising, will be published in 2006 by Ecco Press/ HarperCollins. He has written four off-Broadway plays including “Free Speech in America,” which was cited by the New York Times as one of the 10 Best Plays of 1991.